Following the Archbishop of Canterbury's speech on payday lending in the House of Lords, dubbed The War on Wonga, we developed the strategy and information architecture for the subsequent campaign to boost the growth and use of credit unions in the UK. 100,000 more people joined credit unions in the year after launch (9.1% growth). 71% of church leaders report to knowing what a credit union is compared to 15% of general population. 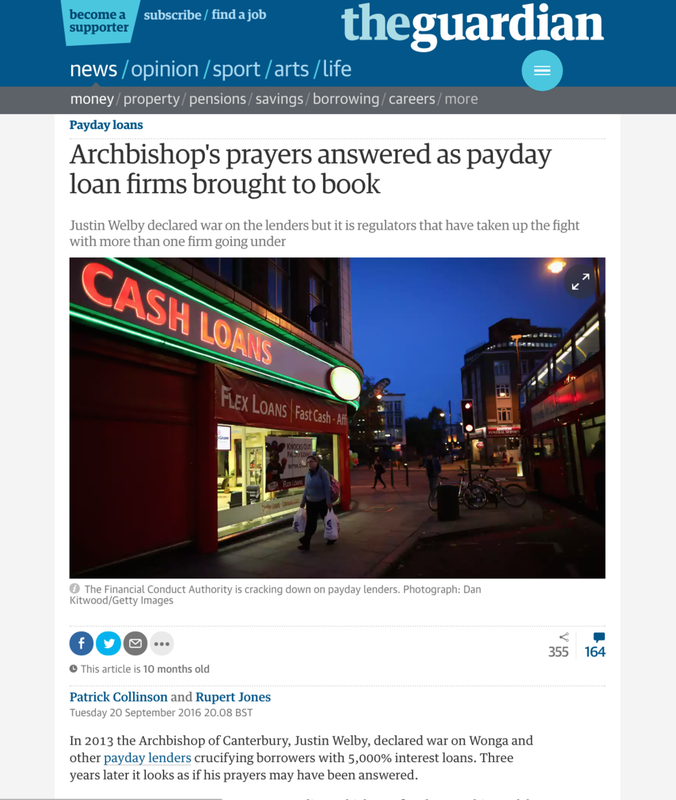 Following the extensive 'War on Wonga' press coverage generated by the Archbishop of Canterbury's House of Lords speech on payday lending and viable alternatives to lenders, his office, with the Church of England and in partnership with the Association of British Credit Unions (ABCUL), sought to build on the momentum generated and subsequent public awareness. A Task Group was created to mobilise and equip both the local communities of the Church of England and the wider general public to engage with the issue, raise awareness, support the credit union industry and apply public pressure to the practices of payday lending organisations. We built upon the aims of the Task Group and created a national behaviour change campaign to build user engagement with the issue. Following extensive research and data gathering exercises on the financial industry, debt culture, payday loans and credit unions, including users and subject matter experts, we developed a national strategy for awareness and behaviour change. Initially this provided the Task Group with 2 - 3 strategic options from which they could decide upon an approach. Identifying key partners and collaborators, isolated during the research stage, we brokered associate and partnership relationships for the Task Group extending the potential reach and expertise for the campaign. We developed and presented brand, narrative, language and taxonomy options for the campaign, leading to the adoption of #toyourcredit as a parent brand for all of the Archbishop of Canterbury and Church of England's work relating to money management and debt. Our work on language and taxonomy was further outworked through the content strategy and digital touchpoints. Alongside the Task Group and stakeholders, we identified areas of engagement for site visitors and prioritised these based on the campaign's strategic objectives. The wireframes and user journeys we created had the specific aim of meeting these engagement points and upon launch of the site, web analytics proved the information architecture successful, as site pageviews aligned precisely with the strategic priorities. The subsequent impact of the campaign has been widely lauded as successful and a major factor in the wider mobilisation of support for credit unions and application of pressure on the payday loans industry. In the year following launch, figures released by the Bank of England showed, one hundred thousand more people had joined credit unions unions in Great Britain, signifying world-leading sector growth of 9.1%. ABCUL also received an award for "outstanding membership growth" by the World Council of Credit Unions.